Built on the water, the “lagoon city” of Port Grimaud is a unique maritime village offering charming properties in marina style. Designed by visionary architect François Spoerry in the 1960’s, it nestles in the Gulf of Saint-Tropez. 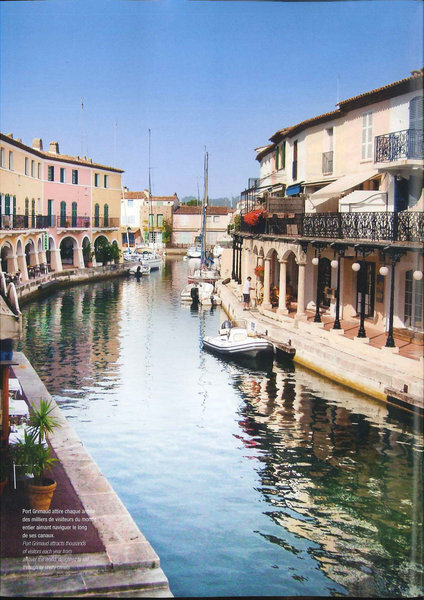 Brimming with Provençal charm, Port-Grimaud is a seaside address which has won the “20th Century Heritage” label. It is made up of little squares and narrow streets, lined with small blocks of apartments and houses with colorful frontages and tiled roofs. A real maritime village, benefiting from shops and restaurants; its living accommodation can be reached from both land and its canals. Most of the properties in fact come with boat moorings. Poetically named “stale”, “Balandrine” or “Cassine”, houses here cost from 800,000€ to 3 million euros depending on their surface areas, characteristics, location, condition, and the size of their moorings. 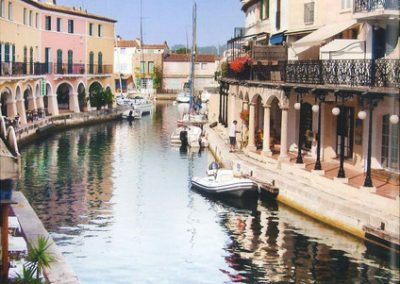 Playing host to almost 2,500 properties and over 2,000 boat moorings, Port Grimaud holds no secrets for Virgile Dolla, manager of the New Place agencies, the second of which recently opened its doors in Port Grimaud South. 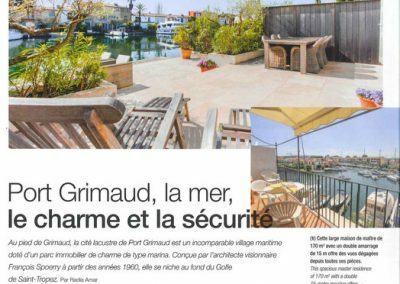 “This second agency brings us wider visibility and creates synergy between the sectors of Port Grimaud 1, more touristic, and those of Port Grimaud South, more residential,” explains Virgile Dolla, himself a resident of Port Grimaud. “While the size of the mooring mostly influences purchasing decisions on the part of clients who already own a boat, we are now seeing that security is becoming an increasingly decisive factor. 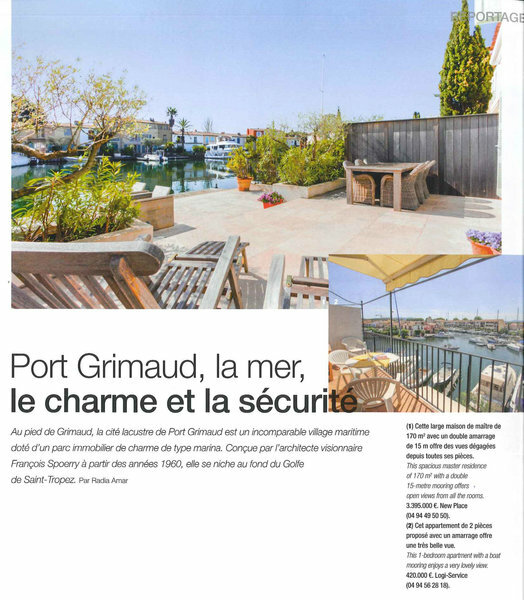 Like some resorts in the USA, Port Grimaud offers a wide array of technical services and surveillance 7 days a week; which reassure and attract a good number of both French and foreign buyers.” Virgile Dolla says that activity in both agencies is very buoyant. 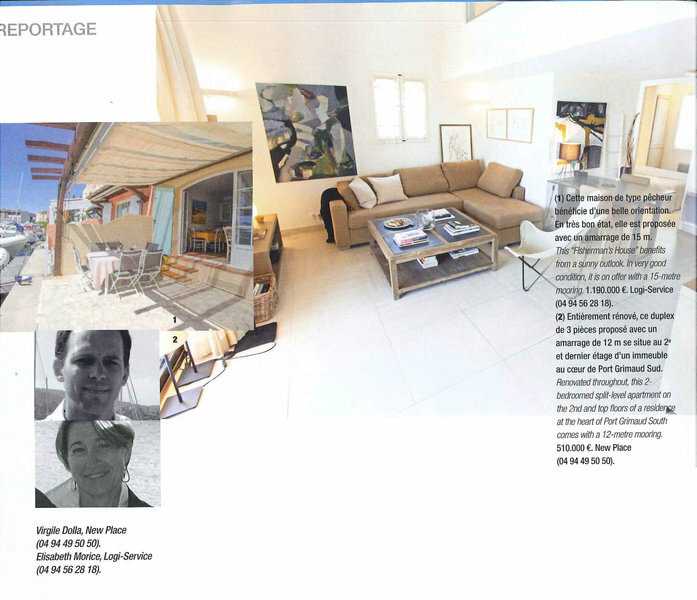 “Confidence in our market has returned, and numerous clients from Switzerland, Luxembourg and the UK are ready to invest significant amounts to treat themselves to their perfect home in our marina. “Opened over 50 years ago, Logi Service is the oldest agency in Port Grimaud. “The market has been very active in the first half of 2018,” says Elisabeth Morice. 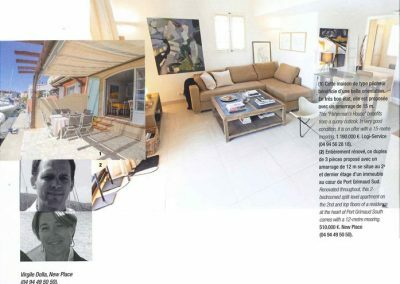 “We received many enquiries for apartments under 250,000€, houses this side of 1M€, and properties with large moorings. We have noticed the arrival of a clientele of young entrepreneurs, and a notable comeback on the part of German buyers. Who all benefit from a wide choice of properties, prices that are stable, and even on the downside in certain cases.” As examples of properties representative of today’s market, Elisabeth Morice mentions a generous “Fisherman’s house” in very good condition, offering an ideal outlook and a 15 metre mooring, on offer at 1,190,000e, and a 1-bedroom apartment with a mooring and beautiful view, priced at 420,000€.